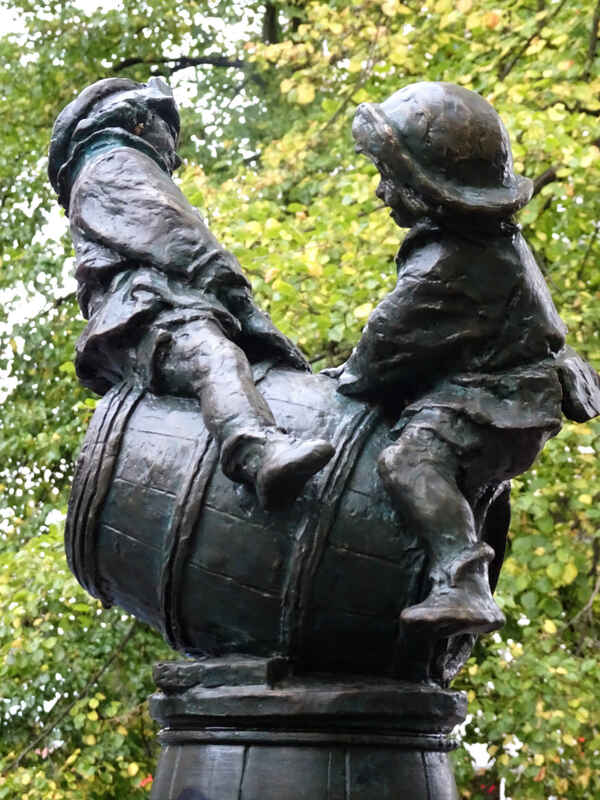 The Bruegel Fountains is another photo essay from my days in Brussels. Again (like the one about the Parakeets) I wrote it originally for Bladet, the magazine of the Swedish colony in Brussels. Mrs SC translated it for me and they published towards the end of 2017. This is its first English language publication. 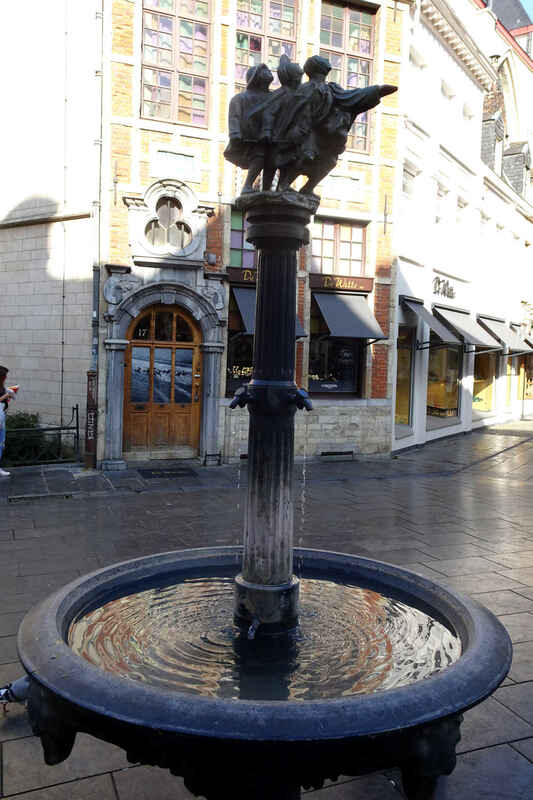 Manneken Pis apart, Brussels is blessed with dozens of public fountains. Once, these were the only sources of clean water available to the poor and the working class. One set of fountains among the others are the Bruegel fountains. Some time in the 1980s, the City of Brussels decided to replace some old fountains with a new design. Possibly the idea was hatched in conjunction with the 450 year celebrations of the birth of Pieter Bruegel the Elder (1530-1569). Or perhaps not. Either way someone decided that each of the new fountains would be topped by a sculpture modelled on figures from Bruegel’s art. The elder Pieter Bruegel (or Brueghel, or Breughel) was a painter and a printmaker, and a significant Renaissance artist of the Low Countries. He is famous for his landscapes and his scenes of peasant life. Probably born in Breda, he was a member of the painter’s guild in Antwerp from 1551. In 1563 he married in Brussels and lived there for the rest of his short life, dying on 9th September 1569. He is buried in the Église de la Chapelle (Kapellekerk). Outside the Chapel Church you’ll find a sculpture of Pieter Bruegel painting — observed by a monkey on his shoulder and curious crow on one corner of the picture frame. The Bruegel fountains don’t stand out, but once you’re alert to them you begin to notice them. The first one I saw was Les Aveugles (The Blind). It’s just outside the St Nicholas Church on the corner of Rue au Beurre and Petite Rue au Beurre. Like several of the fountains, Les Aveugles has two water troughs. At the foot is a basin for dogs to drink from and at waist height is a second, larger basin for humans. The upper basin drains into the lower one. Underneath the upper basin the heads of four dogs look down on the water in the lower basin. Standing in the centre of the upper basin is a fluted pillar with four taps from which the fountain’s water flows. It is this pillar that is topped by a sculpture. Les Aveugles has three blind men walking with their faces turned to the sky. The sculpture is based on Bruegel’s 1563 painting The Blind leading the Blind, now in the Museo di Capodimonte in Naples. I thought Les Aveugles was a one-off, until I happened on Bascule sur un tonne (Rocking on a barrel). This one is outside Bar du Matin at Place Albert where Avenue Albert crosses Chaussée d’Alsemberg in Forest. Bascule sur un tonne is an example of the second fountain model. This one only has one basin — no animals encouraged — but the sculpture is delightful. It is based on a scene in Bruegel’s painting of Children’s Games (1560) now in the Kunsthistorisches Museum in Vienna. After I found the second fountain, I started looking out for more and also searching on-line. In this way I tracked down La Galanterie (Gallantry) in the Vieux Marché aux Grains. And Le Joueur de Cornemuse (The Bagpipe Player) in Rue du Grande-Hospice. There are several bagpipe players in different Bruegel paintings. 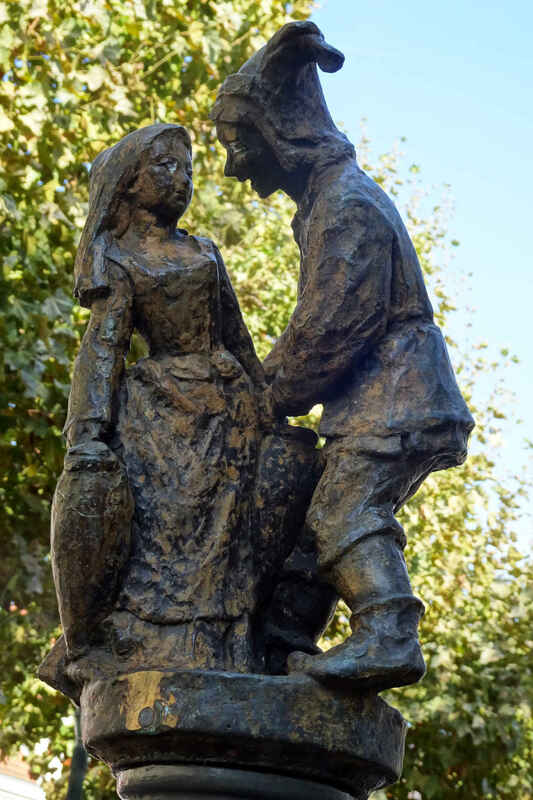 The one outside the hospital looks most like the figure in “The Peasant Dance”, also now in Vienna. La Galanterie has a woman water bearer (she has a water pot in either hand) apparently being propositioned by a young man. Given the title I think he’s offering to carry one of her pots. I don’t know if this comes from one of Bruegel’s paintings or perhaps one of his many etchings. Not all of the fountains remain. One originally in the Nouveau Marché aux Grains seems to have been removed, and the one in Place du Jardin aux Fleurs has been replaced by what looks like something bought cheap from a modern garden centre. Also, the two fountains that should be at De Broukère — one outside Hotel Metrople, the other opposite outside the cinema — have been taken away while the rebuilding work there is going on. Still, I found three more. If you walk up from Grand Place on Rue du Marché aux Fromages, near the top end outside an Italian restaurant is La Moisson (The Harvest). Two figures, back to back, drinking and eating. The drinker at least comes from Bruegel’s painting called Work break. Further on up, in Rue de Rollebeek outside the Crosly bowling alley is Hommes titubant (Men staggering) with figures from The Fight Between Carnival and Lent. Finally — the open space between Rue Haute and the lift to the upper town by the Courts of Justice. 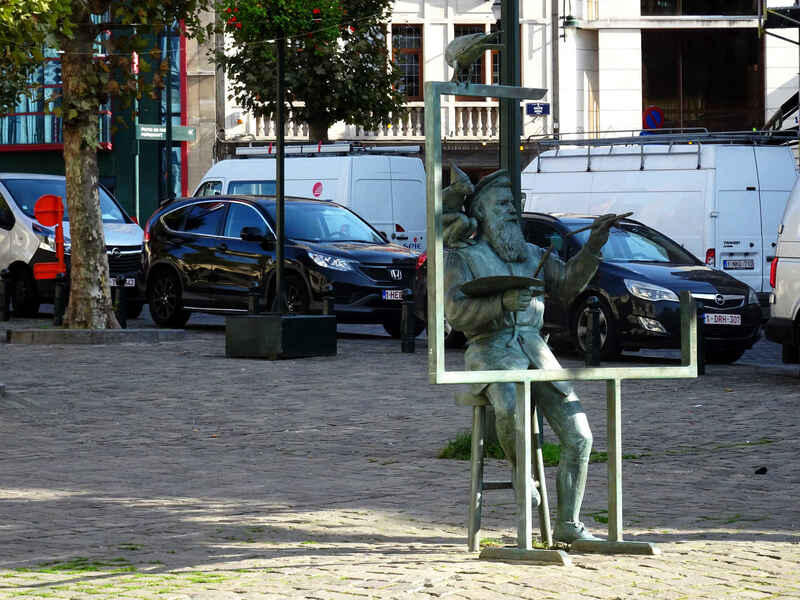 (This, Brussels tourist information assures me, is Place Breughel — though there is no sign in the square to prove it.) Here is a fountain topped with a monkey: Le Signe. I’m publishing this article for the #Blogg52 challenge.